I have just completed a third children's book where all net proceeds will again go to charity. 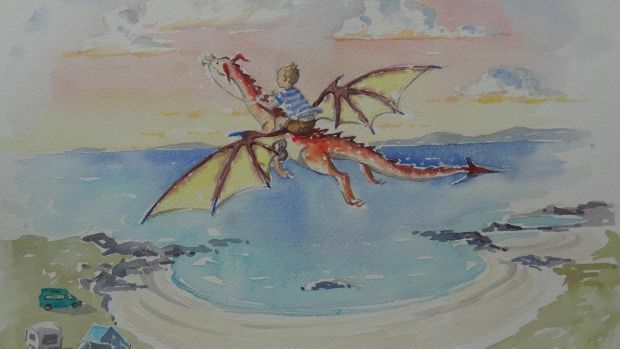 In the last 2 1/2 years more than €45,000 has been raised from sales of the first two books - The Boy who wanted a Dragon and The Return of the Dragon - almost €15,000 shared between the Blackrock Hospice and Cottage Home Child and Family Services and more than €32,500 for Temple Street Children's Hospital. My wife and I contribute to 10 different charities. I have written children's and adults' poems for many years and always had notions of publishing something. So why not for charity? When I hooked up with an art teacher and very talented illustrator I knew the project had legs. Then my grandson was hit with multiple respiratory viruses the Christmas before last and spent 5 days in intensive care in Temple Street. He received a fantastic level of care at a very scary time and I really wanted to say thank you in a tangible way and to give something back - thus the second book. Book number three will also be raising funds for the Temple Street Foundation. Apart from raising fairly significant funds it has raised awareness of the work of the charities through school and library visits, newspaper and radio coverage and a TV appearance on Ireland A.M. Many Irish organisations are perhaps uniquely dependant to a large degree on fundraising and Irish people are generous with their support. The projects have also been very effective in explaining to young people the importance of giving and caring about others who are less fortunate. Creative projects where all (not just a tiny amount) goes to charity grab the attention and interest of the public. This is true particularly where an attractively presented, quality item is well priced and the buyer has the double satisfaction of purchasing a nice gift and helping a worthy cause at the same time.